acquired their infections prior to their arrival. tion had a primary CF rise with dengue II (Table 2). contained numerous rine-form- of Plasmodium fatciparum. No garnetocytes could he identified. there, he had made -seeral business trips to Angola. country where falciparum malaria infection is endemic. documented in any of the outbreaks. unusual. Although S. infants is a rather common serotype. veillance reports of the Salmonellosis Unit, NCDC. 332 (5.0 percent of the total), in 1968.
wise, due to S. infants. South Carolina........... 41 32 294 263 through previous months. and 69 were in children under 10 years of age. the -sam period for 'he years 1952-1955 and 1962-196*. of 170 in 1952 to a low of 66 cases in 1963. *Data inot pre.antly ioaitab le for 1956-1961.
,' .- '. / I.
: : -..' .1 r.
creased number of cas-es occurred in the s-unmrer months. ~ 1., Eastern Encephalitis (EE). California (CE). and St.
commonly associated with encephalitis in 1967.
sles, mumps, chickenpox. and rubella are shown in Table 7.
roup Male Female Conf. Isol. Conf. sol. Conf. so. onf. Isol. 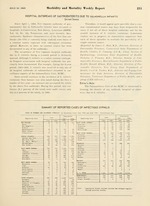 in 1967 while the reported deaths decreased from 10 to 8.
responsible for the illnesses in the missionary family. for only 1 to 2 percent of strains typed at the NCDC. Vol. 18, No. 23, p. 204.
a M -4 z .